Bald eagles chose the post-industrial wasteland of Chicago’s way South Side to build their first nest in the city in 130 years. The Chicago PD cancelled plans for a huge outdoor firing range nearby that environmentalists hated anyway. Just a couple years after the Shiba Inu cam sensation, wild animals are fascinating millions of viewers with reality TV, family tragedies and triumphs. Eagles nesting by an Iowa fish hatchery have become online stars. 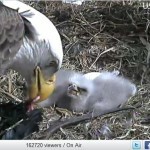 More than 100,000 people watch the pair feed their chicks and hope for another egg to hatch. Alaska bird rescuer Cindy Palmatier won’t know for a month if the eagle that plunged into the snow while clutching her mate will ever fly again. Cindy Palmatier, director of avian care at the Bird Treatment and Learning Center in Anchorage, says the eagle did get bandages off one wing and may get to go outside Wednesday or Thursday. The eagle pair became national news after they locked talons in their courtship dance on Easter morning and didn’t let go in time. Normally they swing each other around, then break free. This time, at least one of them miscalculated and they crashed into the snow in Valdez. The male died on impact. Bob Benda, a biology professor, was on of the first on the scene and thought the female was dead, too, then noticed she was breathing. Benda kept the bird overnight in a crate and again thought she died, the Valdez Star reports. In the morning he was happy to see her alive and got her flown to Anchorage. 20 States Host Bald Eagle Festivals; Six This Weekend. 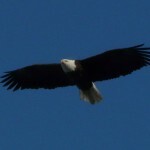 Is There A Bald Eagle Near You? In January and February rivers freeze and bald eagles have to come down from Canada to visit us. To capitalize on the event, Audubon clubs and parks around the country hold Bald Eagle Days or Festivals to give people a chance to see our national bird in places they haven’t been seen in generations. Within a couple hours of New York, Boston, Chicago and Dallas, you can see eagles. Twenty states have bald eagle festivals, although two have cancelled this year because of the recession. The Upper Skagit Eagle Festival in WA and the CT Eagle Festival won’t be held this year. The eagles still show up, you just don’t get the luxury treatment, which usually entails scopes and hot chocolate. CT Audubon even still has $40 boat tours. We’ve got six bald eagle events this weekend. We don’t just have a national bald eagle day because they show up at different times around the country. 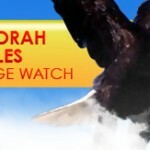 The peak for eagle days is the first weekend in February, with 11 states having eagle-watching events.